"The Twilight Saga" has been a series that has been good enough but never been really great watches. 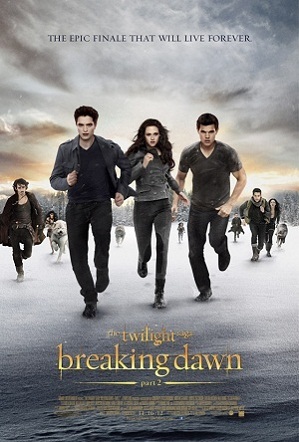 In fact, its last effort with "The Twilight Saga: Breaking Dawn - Part 1" was the worst one yet. An effort that was mostly disappointing and a film going nowhere quickly. "The Twilight Saga: Breaking Dawn - Part 2", we are happy to say, is a very different beast from its predecessor. While at first glance, it seems that nothing has changed in the first half of the film, the second half will completely blow your mind. The slow portions may tick people off but the action-packed, shocking latter portion is all worth the wait and effort. After being brought back from near-death by Edward (Robert Pattinson), Bella (Kristen Stewart) begins her life as a vampire and mother to their daughter, Renesmee (Mackenzie Foy), who is growing at an accelerated rate. But when Irina (Maggie Grace), a vampire whom the Cullens consider as a cousin, mistakenly reports Renesmee as an immortal child, the Volturi sets out to battle and destroy the Cullens for breaking vampire law. To prove Renesmee is not an immortal child, the Cullens gather foreign vampires to stand as their witnesses to the Volturi. Unfortunately, Aro (Michael Sheen), the Volturi leader, has ulterior motives for battling the Cullens. With their allies, the Cullens defend themselves and Renesmee against the Volturi. "The Twilight Saga: Breaking Dawn - Part 2" has an ace up its sleeves. It's the one thing that made "Breaking Dawn - Part 2" not only bearable, not only watchable but also the thing that makes this a worthy conclusion to the "The Twilight Saga". Without spoiling much, what we are talking about, is the end part of the film where Volturi and Cullens meet face-to-face. You just have to see it and experience it first hand to know what we are talking about. It is not only one that is completely opposite to what we usually get from a "Twilight" film but it is a complete and literal breath-taker. Mind you though, this does not mean that "Breaking Dawn - Part 2" is one for the books. Frustratingly, as much as we loved the second half, we loathed the first half as much in return. The first portion felt tedious, monotonous and slow. Like its predecessors, it was mostly fluff and talk without any much substance. And even though we can easily conclude that this is the best film for the whole series, the other films that came before are so-so and good efforts at best. "The Twilight Saga: Breaking Dawn - Part 2" is a good conclusion for the series but we doubt that it would make people who don't see much from the books or films change their stance.